“Provided also that the return in FORM GSTR-3B for the month of September, 2018 shall be furnished electronically through the common portal, on or before the 25th October, 2018.”. Note:- The principal notification number 34/2018 was published in the Gazette of India, vide number G.S.R. 761(E), dated the 10th August, 2018 and was last amended by notification number 47/2018 was published in the Gazette of India vide number G.S.R. 858(E), dated the 10th September, 2018. 2. 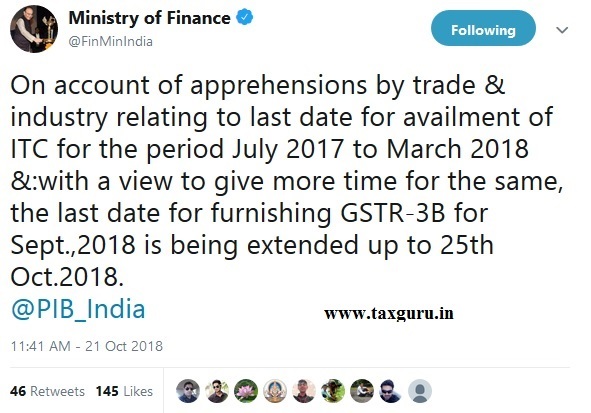 In view of the said apprehensions and with a view to give sonic more time to the trade and industry, the last date for furnishing return in the FORM GSTR-3B for the month of September, 2018 is being extended up to 25th October, 2018. Relevant notification will follow shortly. 4. It may also be noted that the Government has extended the last date for furnishing of return in FORM GSTR-3B for the month of September, 2018 for certain taxpayers who have been recently migrated from erstwhile tax regime to GST regime vide notification No. 47/2018- Central Tax dated 10th September, 2018. For such taxpayers, the extended date i.e. 31st December, 2018 or the date of filing of annual return whichever is earlier will be the last date for availing ITC, in relation to the said invoices issued by the corresponding suppliers during the period from July, 2017 to March, 2018. Many of the Tax payers made inadvertent mistakes while filing TRAN-1, availment of ITC, Filing of GSTR-3B. Availment of Double payment of credits were also taken place in many occasion due to issues related to GST portal. We would like to know, any interest is imposed on Tax payers on such mistakes due to issues of GST Portal. i already filed return what can i do now. is it possible to claim input. i advised last date to claim input will be 31.12.2018. This kind of government approach is useful only who file returns on last date or who file returns after due date. When GSTR1 is extended , equivalently GSTR3B for the month september has to extend. otherwise it looks illogical. Due date extension after due date of 3B is just like…giving oxygen to patient after death. What can we do now when we have already filed the returns. How can we claim ITC now? It’s very shameful for the govt, to extend due date after expire of the previous due date.. Totally not enough since tax payer need more time to verify and reconcile the input tax credit statement GSTR3B and GSTR2A. Because of it is very difficulty to find out particular month tax invoice in GSTR2A. For example a tax payer received tax invoice for the month of July 2017 and reported the same in their GSTR3B for the month of July 2017. But respective vendor reported the invoice in the month of September 2018. The receiver should verify their GSTR2A till September 2018 to reconcile the tax invoice, which reported in the July 2017 STR3B. GSTR2A should be update based on tax invoice date, those uploaded in the tax payer portal account after GSTR1 filed by respective supplier end. But current system is data is uploaded based on return period month only. So this is very difficulty to reconcile the ITC statement between GSTR3B and GSTR2A. Date Extended after due Date of 3B, Not useful at all.